As hopefully Webber can grab another Pole Position with Master ‘Zebb as his Wingman – for another Red Bull Front Row lockout, eh? Although NO word on ‘Weather or Not that funky wet stuff will appear during Saturday’s festivities? In typical fashion, once again it was the Red Bull Freightrain pulling onto the front row of the Grid, as Master ‘Zebb, a.k.a. Sebastian Vettel led the parade ahead of teammate Mark Webber. While Fredrico Suave, a.k.a. Fred Alonso was third, even after having shut off his Ferrari lump during the day’s first Free Practice (FP1) session, whilst teammate Felipe Massa saw his Seamless Shift transmission try selecting two gears at once after hitting a nasty bump in FP2. And then the rain came, as Kubica was fastest in the morning’s WET Free Practice session, (FP3) before we were once again watching the cars slither around in the “wet Stuff!” As the Q1 session saw the most inclement weather conditions. As ironically Adrian Sutil failed to move onto Q2 for the first time this year and claimed his teammate was absolutely ‘Rubbish out there... As the two drivers almost collided, whilst the Red Bull Duo were happy to wait out the remaining minutes of the session in the garage; just being nipped by “Ferdi-the-Putz!” (Alonso) Who bolted on a fresh set of “Interz” (Intermediate tyres) with Webber second & Vettel third; Button was eighth & Hamilton was ninth, with the surprise of the session being Sauber’s “K-Squared” (Kamui Kobayashi) in fifth. Moving onto Q2, once again it was the ‘Zebb “N Webber Show, as the Red Bull Duo moved forward one spot apiece; with Webber P1 and Vettel P2. Then it was onto the ‘Final Cut, as shockingly – The Incredible Hulk came outta NOWHERES! 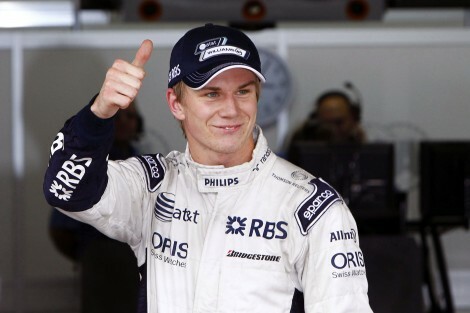 As the young German Nico Hulkenberg blitzed the entire field to secure his debutant Grand Prix Pole – in his Rookie season! As it was pretty funny to hear SPEED’s Bob Varsha calling Master ‘Zebb a “Grizzled Veteran,” especially since he noted Vettel’s only 47-days old-ER then The Hulkster; Hya! Although I haveda say it didn’t look like Nico’s uniform sleeves were deranged at all during the Top-3 interviews... Oh Never Mind! As I’m sure the neighbors were wunderin’ what all of my jubilant exaltations were about, eh? While Vettel seemed pretty happy and I thought that even Webber seemed relieved during his Post ‘Qualie interview. Pole) Nico Hulkenberg, Williams; P2) Sebastian Vettel, Red Bull; (-25pts) P3 ) Mark Webber, Red Bull; (-11 pts) P4) Lewis Hamilton, McLaren; (-21pts) P5) Fernando Alonso, Ferrari; (Points leader) P6) Rubens Barrichello, Williams; P7) Robert Kubica, Renault; P8) Michael Schumacher, Mercedes; P9) Felipe Massa, Ferrari; P10) Vitaly Petrov, Renault.